California winter is nothing compared to the winters of those living north, east and south of me and any combinations thereof. We’ve gotten some welcome rain, but not enough . . . never enough, but that may be only my take on it. Actually, these choices are quite difficult for me. I’m not ready to let go . . . and I’m not feeling eager to jump in. I don’t feel it would be fair to a new pet. I suppose waiting is the best choice for me at this time. I have my blogs which I’ve been neglecting and a book I’m writing and also neglecting. Then there’s everything else that has been put on hold as well. So, I thought a road trip was in order. To the beach to visit my childhood stomping grounds . . . a leisurely stroll on the beach . . . then moving up to the mountains . . .
Then to the desert . . .
It’s nice to get out and my little Yorkie enjoyed her outting. New things to see and explore . . . together. It’s wonderful to live close to so very many places that seem so very different . . . but at some phase in my life they’ve all represented “home” to me. Strange how we sometimes don’t appreciate what we have or notice what we have available to us until we take the time to explore and think about it. How many times do we see without seeing? We’re busy with our lives and all the things that keep us busy. Yes, there is always something to do. I was surprised by an old section of town that I had taken to the mountains on more than one occasion. It didn’t dawn on me until a few days ago when I was running errands. Yes, the landscape had changed over the years, more freeways connect from one location to a new destination, but there was quite a lot of nostalgia in that section of town. I’m sure it’s true where you live, too. There are plenty of fast food places there now, the old gas station is much more modern, but it’s still there. Isn’t it strange how things seem so much smaller than you remember them? All a matter of perspective, perhaps. And then there are some things that have grown larger and much more impressive than in memory. Nature has so very many lessons to teach us about life. It’s our job to take a break once in a while and reflect upon them. It is disappointing when you find a great concept, but the product doesn’t work. I thought this was an excellent idea for pouring batters without the mess. Unfortunately, this isn’t the solution. The batter slips under the silicone pour spout. If there’s a way to seal it in place, then you’d have a winner here. Now, if you’re using dry ingredients, this works fine. Don’t waste your time and money with RSVP Silicone Slip-On Pour Spout! I’m finding January to be a time for reflection. Lots of thinking with little being accomplished. It may be the weather or just the mind and body’s way of slowing down from all the holiday hoopla. It’s interesting how an ordinary day can bring inspiration. The routine outside my window is normal with the power walkers swiftly walking down the hill talking away. I once thought they exercised their jaws more than their legs, but they’re still at it, every morning at first light in the morning. A few years ago, I had a little difference of opinion with one of the girls. She would pitch her energy drink cup in my roses. I confronted her and told her I didn’t appreciate her littering my roses with her YooHoo drink. She refused to pick up her discarded cup, but got huffy about me calling her energy drink YooHoo. Her friend teased her about drinking YooHoo during their morning walk. I started drinking my coffee on the front porch, waiting for the power walkers. I could see them walking. I got up and stood by the roses, daring the young woman to pitch her drink cup in my roses. Seeing me, they cut across the street. As I stood there, I wondered how I became that old women who told passers by to keep off her lawn. The scenario was different, but the sentiment was the same. I had no more trouble with the power walkers and I no longer drank my morning coffee on my front porch, but I watched from the window. There were the dog walkers, joggers and older couples going for their morning walk. They would return in the early evening. My morning routine changed. I no longer watched the morning sun rise and evening sun set over my view from the breakfast nook window. I got into my blogs, crafts and daily routine. But today, I’m at my window with my coffee and my spinach, tomato and scrambled egg breakfast with a lightly toasted English muffin. Comfort food with a bit of strawberry jam. The telephone’s ringing, but I prefer not to be disturbed. It will go to voice mail, if a message is important enough to collect. Most of the time there is no message. That’s fine with me. I have my novel to write, errands to run and my house to tidy up. 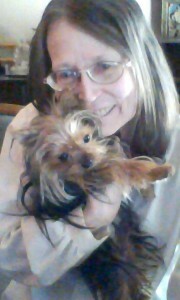 I took a leisurely walk around the neighborhood with my little Yorkie. She loves to be out exploring all the smells left by the walkers and dogs. It might seem a bit disgusting, but I’ll never truly understand a dog’s life as she may never understand mine. We continued around the block. A woman called out from her window. I guess I’m not the only one who watches. Hollywood has made movies about “watchers” which usually has a sinister twist, but this particular woman probably has no more sinister motive than I have, it’s merely a beginning of a day. It did make me wonder how many others “watch,” but say nothing. Many may be gone to work, some may work at home. I do enjoy the leisure of working at home. I choose my own hours and do as I please. It is true freedom from the 9 to 5 routine of a regular job. But working outside of their homes may have its perks. It is all a matter of perspective. A choice perhaps. Just as the morning news . . . nothing inspiring, just complaining . . . always unhappiness about the world . . . no one satisfied . . . our happiness or sadness may be a choice. It’s all a matter of perspective. There is much to enjoy and admire within our own environment. Fresh air, being outside, walking leisurely around without a care in the world. I do learn much from my little Yorkie. She looks for adventure, or so it seems. Having her nose to the ground one moment and in the air the next, but moving along. She follows the sidewalk, her pace quickens as we approach our street. Soon our walk will be over and she’ll settle down to her morning nap. Such a grand life she leads without a care in the world. Basically, what you see is how your make them. Buy some pretzel sticks, dip them in white and dark chocolate. Set them on wax paper to dry and place them close together to stick to each other. Then embellish them however you choose. I’ve used candy corn for the nose. 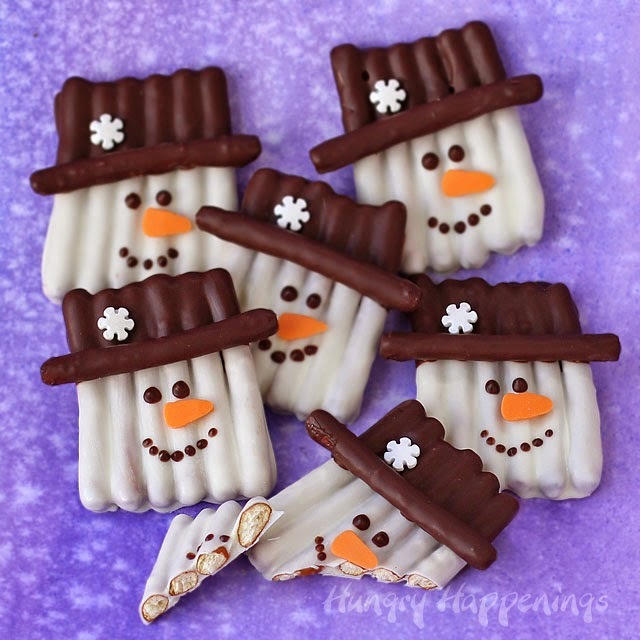 You can add some wonderful embellishments to make these pretzel snowmen original. I love Free Printables, especially boxes for all occasions. This special occasion is St. Valentine’s Day. You can fill it with all kinds of wonderful goodies for family, friends, classmates, teachers — whomever you want to give a special gift of Valentine’s cheer. The box measures 2 inches x 2 1/4 inches. Not too big and not too small, just right to give out to guests as party favors. They would truly be gifts of love. Print out the template on card stock, follow the directions and you have a perfect Valentine’s Day Box you can fill with all kinds of wonderful goodies as gifts to share with friends and family. Everyone likes to be remembered on Valentine’s Day.